In God’s Master Plan for planet Earth the most important event to occur during Earth’s second 1,000 year period was the global flood. Noah was born year 1,056 and 600 years later (year 1,656) the flood occurred. 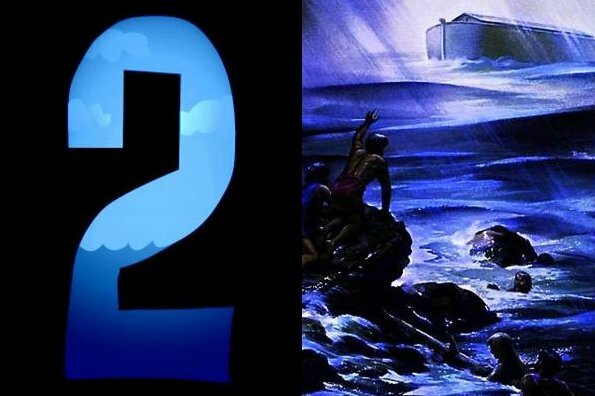 But here’s the SHOCKING truth … the story of Noah, the Ark, and the destructive worldwide flood is a prophetic parable about Christ’s Second Coming. In other words, the story of Noah and the flood is unfulfilled prophecy, soon to be fulfilled! Noah represented Jesus. As Noah worked building the Ark, it was a picture of Jesus building (preparing) heaven. The Ark had 3 levels, rooms, windows, and one door, all of which are a precise Biblical picture of heaven. When Noah was 600 years old his family entered the Ark, and God shut the door! Likewise, God will shut the door to salvation on the day of Christ’s return Earth’s 6,000 year. Finally, Noah’s righteous family rose up high into the air to safety as a world of wicked people ALL perished in a flood of water. This foretells Christ’s righteous family will rise up high into the air (rapture) to safety (to meet him in the clouds) as a world of wicked (beast-marked) people ALL perish in a flood of fire. So how did God foretell of this momentous event in the second day of Creation? It’s in these words: “And God said, Let there be a firmament (sky) in the midst of the waters, and let it divide the waters from the waters” (Genesis 1:6). Before the great flood of Noah’s day the sky had never seen rain; the Earth was watered by a mist coming up from the ground. But at the time of the flood, the “fountains of the deep broke open” and spewed water high into the air, so the sky was in the midst of the water. And afterward, Earth’s water was divided by the clouds above and oceans beneath. 6. And God said, Let there be a firmament (sky) in the midst of the waters, and let it divide the waters from the waters. 7. And God made the firmament (sky), and divided the waters which were under the firmament (sky) from the waters which were above the firmament (sky): and it was so.